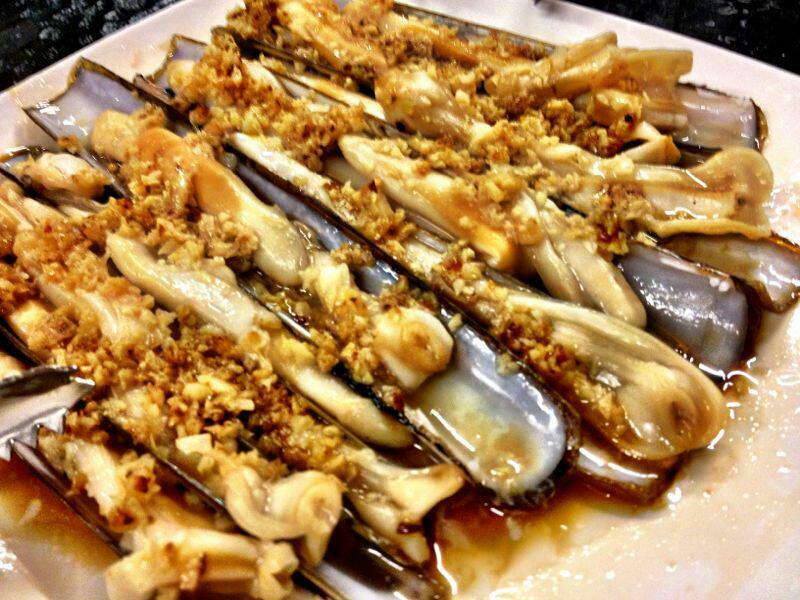 Steamed razor clams is a common dish served in many seafood restaurants. I had many times very good ones at Ah Yat Turf City and couple times at Long Beach Dempsey. These days, cooking methods & processes are quite precise and I seldom come across a live fish that is not steamed just right (in older times we get undercooked & overcooked fish). The same with razor clams. No recipe is needed to cook this dish really. It is just a matter of getting the razor clams, cleaning them (which is a big hassle) and then steaming PLUS doing the lightly browned garlic oil to drench over them. I get my IQF (Individual Quick Freeze) razor clams from Giant hypermarket & Shop n Save (these days you get IQF everything – mussels, scallops, fish fillets etc). Normal price is S$11.95 for one 500g packet containing 8 to 11 large razor clams. Sometimes I get them during sales and it can be S$8.95, so just about $1 per clam. At the restaurants, you get live ones & will on average pay S$8++ (about $9.40) per clam. Cleaning as I said is a hassle. I use kitchen scissors to cut away the blackish sag of innards & clean each clam thoroughly in slow running water (there will be a lot of soil & you will feel like you are eating sand if you don’t clean them). For the garlic oil, I just fry minced garlic on low heat with oil to brown them & then set aside the lightly browned garlic with oil in a bowl. To steam the clams, you can use the usual steamer for about 6 minutes (just make sure you are able to remove the plate holding the clams out of the steamer when it is very hot). I find it easier to just poach the clams (w/o the shell) with the garlic oil & add 1 tablespoon light soy sauce in a covered saucepan for a few (about 4) minutes. Then I remove the steamed clams, place each on an individual cleaned 1/2 shell on a serving dish, and then spoon the garlic oil over the clams. The result is the beautiful dish above. I would say it is 95% as good as the restaurants that do them well, and better than those that can’t do them properly. Prepare the clams – defrost, cut/remove from shell, cut away the blackish sags of innards & clean thoroughly, airdry in fridge. clean enough 1/2 shells to place the clams on. Cook the clams – lightly brown the minced garlic so you have the garlic oil ready in a large saucepan. add the clams & drizzle 1 tablespoon light soy sauce over it. Turn the fire to high to heat up & then quick lower to medium & cover for 4 minutes until the clams turned a white opaque colour (as in above picture). Turn off the fire, remove the clams & place each on cleaned individual 1/2shells on a large serving dish. spoon the garlic oil over each clam & serve. This entry was posted in Recipes and tagged bamboo clam, garlic oil, razor clams. Bookmark the permalink.